This news item was posted in Pakistani News category and has 0 Comments so far . The Anti narcotics Force have foiled a bid to smuggle drugs worth 250 million rupees and arrested driver of the container loaded with a large quantity of drugs at Motorway Interchange near Islamabad. 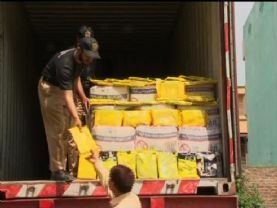 During checking at Motorway Interchange, the ANF managed to trace 3000 kilograms of high quality Charas from the secret chamber of a container, coming from Peshawar. The ANF seized Charas and arrested the driver of the container. According to the ANF officials, this Charas was being taken to Karachi for smuggling abroad. During initial probe the driver informed that he was not aware of the drugs hidden in the container. The ANF teams conducting raids to arrest other culprits involved in drug smuggling.